"Some might say their friendship is unusual, but don’t tell them that. They get each other." Orville can be a reserved rat. 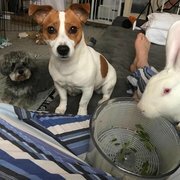 He's a bit shy with new people — until he sees them interacting with his best friend, a more gregarious bunny named Wilbur. "We’ve noticed that if we start petting Wilbur, Orville will come see what we’re doing and sniff every inch of our hand. He’ll even sometimes start grooming us," Jessica Jorgenson, a spokeswoman for Animal Rescue League of Iowa, tells The Dodo. "Whereas if we try to approach Orville first, he tends to initially shy away. He definitely draws confidence from his buddy Wilbur." Are you surprised to see a pair this cute and unusual? The shelter was, too! Wilbur and Orville came into the Animal Rescue League of Iowa at the end of September, after being caught by local police in a trap that'd been set out for cats. Both are young — about a year old, or even younger — healthy and obviously not wild. They also seemed to know each other well — probably having lived together, before either escaping or being set loose. 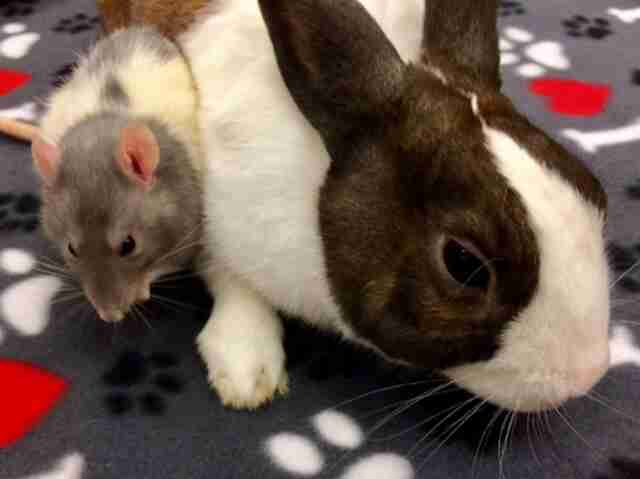 Once they got to the shelter, Orville clearly looked to Wilbur for safety and companionship — on the first day, when anyone tried to pick him up, Orville chose instead to burrow under the bunny's belly. Shelter staff housed the pair together and they've been happily ensconced ever since. 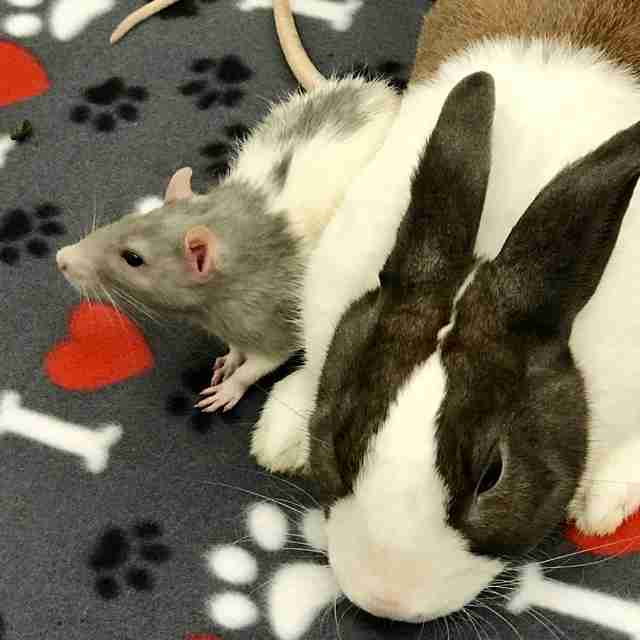 "Through a series of very lucky events, Wilbur and Orville found their way off of the streets where they were left to fend for themselves," Stephanie Filer, the shelter's manager of special gifts and partnerships, tells The Dodo. "The resiliency of animals continue to amaze us." 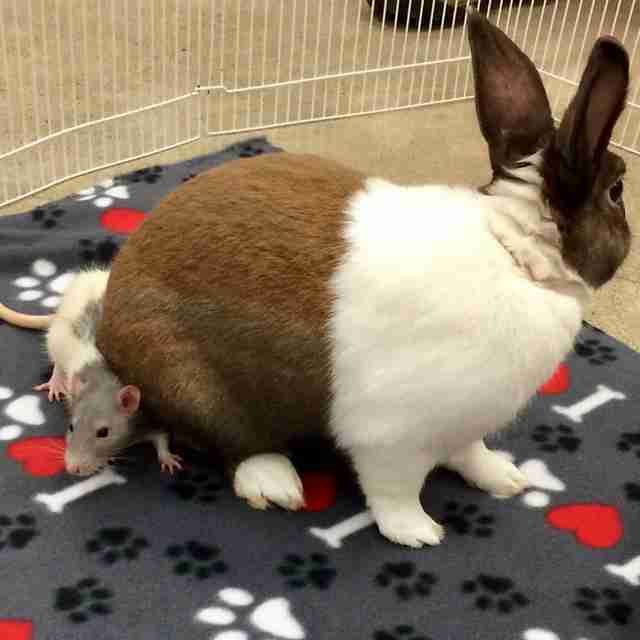 The shelter waited awhile before putting Wilbur and Orville up for adoption, in case someone was going to come looking for a missing rat and bunny duo. This gave staff about a month to observe just how charming these two really are. They groom one another and snuggle down together. They were recently caught playing chase up and down a ramp in their enclosure. "Their sleeping routine is adorable, too. Wilbur finds a comfy spot on top of his blanket, and Orville burrows under both the blanket and Wilbur, so he’s sleeping partially underneath him," Jorgenson says. "They are totally comfortable with each other." There was never any question that, when they did go up for adoption, the shelter would find Wilbur and Orville a good home together. "We never considered separating them," Jorgenson says. Just a few days ago, the shelter decided it was time. Wilbur and Orville were placed for adoption. 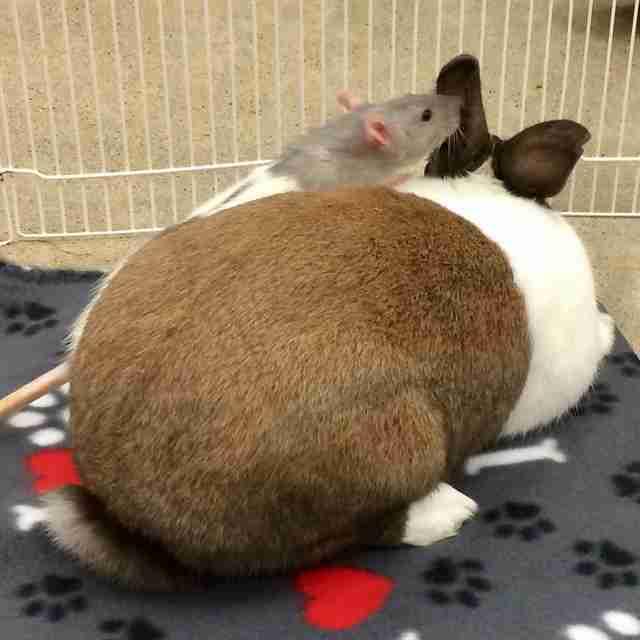 The shelter was looking for someone experienced with rats and with bunnies, who'd adore Wilbur and Orville as much as they adore each other. "Some might say their friendship is unusual, but don’t tell them that. They get each other, and that’s all that matters," reads a Facebook post about the twosome. That perfectly adoring, experienced person came walking through the door on Wednesday. 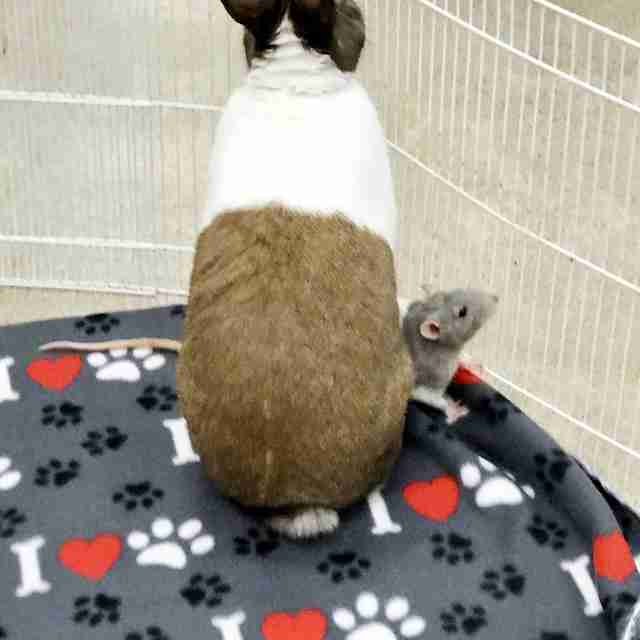 The adopter, a woman named Carol, came into the shelter looking for a rat to add to her diverse menagerie, which includes zebra finches, turtles, a guinea pig and two adopted dogs. 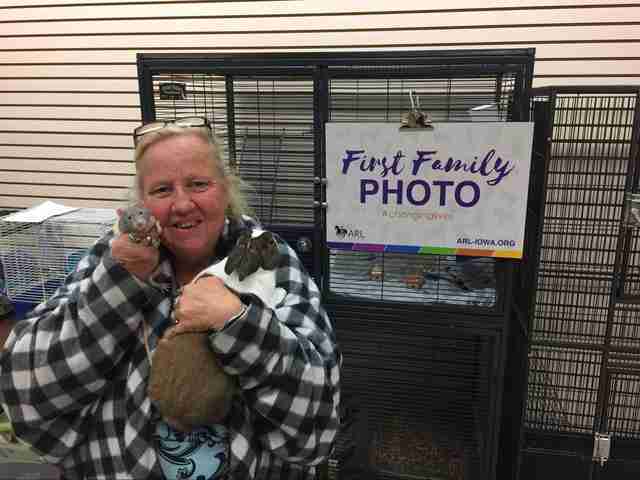 She met Wilbur and Orville, and thought "these two would add to her odd but perfect little clan," as adoption staff put it in an email to Jorgenson. It's an almost fairytale ending for a couple of unlikely friends. To staff at the Animal Rescue League of Iowa, there's a lesson here for us humans, as well, from the animal kingdom. "They are quick to forgive and they are often able to look past their differences to form lifelong bonds," Filer says. "Orville and Wilbur can teach us all a few things about how to treat each other, too." You can see more animals up for adoption at the Animal Rescue League of Iowa or donate toward their care here.